← Oh No, It’s Monday! 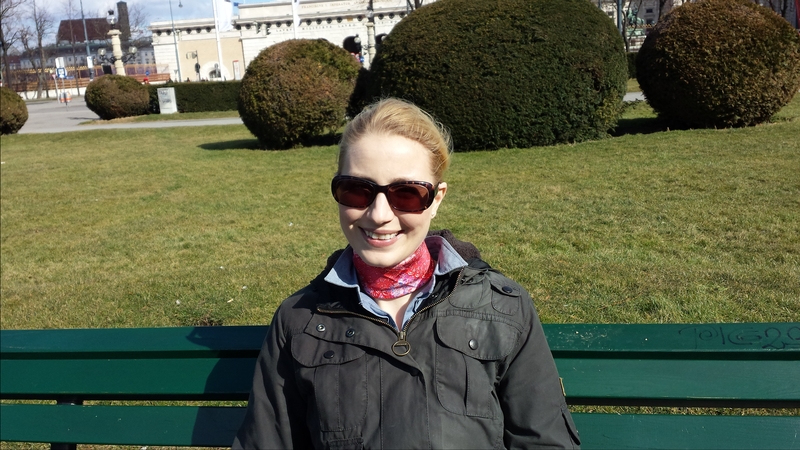 After knowing Birgit (Olfactoria) for 4 years now, I was beyond excited to accept her kind invitation to come and stay with her family in Vienna, Austria at the start of this month. The city was everything I had hoped for and more. I found it strikingly beautiful, incredibly civilised (yet welcoming) and embedded with culture at its very core. From a practical point of view, it is also spotlessly clean and easy to navigate. It’s clearly a great place to live, so I can completely see why it hovers at the top of the list of cities with the highest quality of life in the world. Having a sight impairment and never flown alone before (plus being a nervous flyer), I was anxious about the journey. However all went well and Birgit, The Husband and their two adorable boys (Niki, 5 and Pauli, 8) were there to meet me at Arrivals. As anyone with a family will know, you don’t lie-in when young children are around and this worked out well for making the most of each day. Bright and early on Sunday morning we had a superb breakfast cooked by The Husband, which included bacon – of course! – done with maple syrup and a touch of chilli. 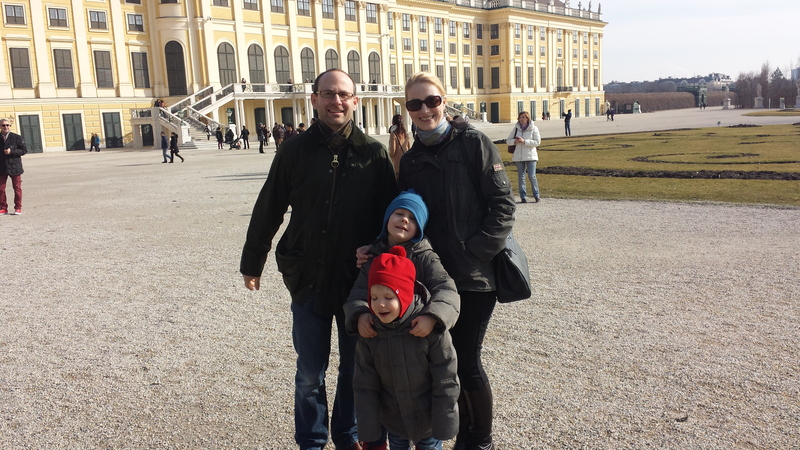 Then we were off to Schönbrunn, the former imperial summer residence and the largest palace in Austria. It has a stunning façade as you can see from the pictures. It also has extensive gardens which must be quite something when in full bloom. We looked around the exquisite rooms of the palace but for preservation purposes you’re not allowed to take photos. 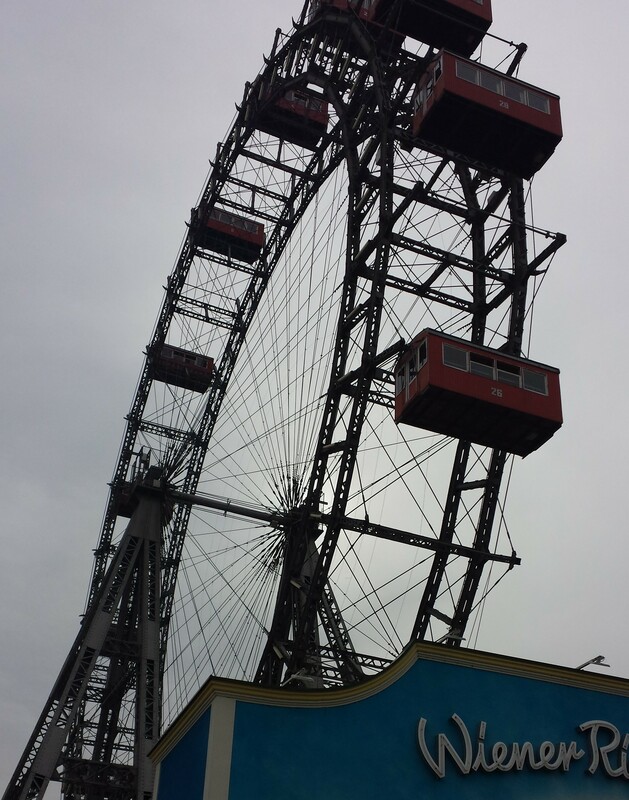 In the afternoon we visited Prater amusement park, with its 212ft tall Ferris wheel built in 1897. We took a ride on the wheel but didn’t realise The Husband was worried about the height until we neared the top. Being the consummate medical professional he is, he was more interested in observing his body’s reaction to his rising sense of panic than actually giving-in to it. Monday morning I happily got to meet the lovely Sandra who also writes for OT. 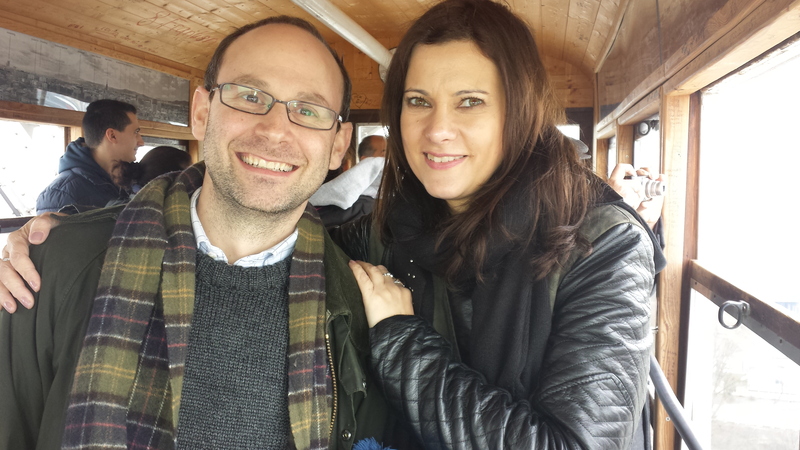 An American who has lived in Vienna for 20 years, she was even more warm and generous than I expected she would be. It was a pleasure to get to know her on this trip and to meet her gorgeous son, Sean. After a good chat over breakfast, Birgit and I set off for Time Travel Vienna. This entertaining guided tour really was a hoot and a half. It’s down in the cloisters of an old monastery and is a fun way to learn some facts about city and its history. The highlight was a multi-media cinema experience which had us whooshing through time and landing at various significant points in Vienna’s history. We could feel the wind in our hair, our seats tilt during a carriage ride and even the rats’ tails flicking against the backs of our legs at the time of the bubonic plague. 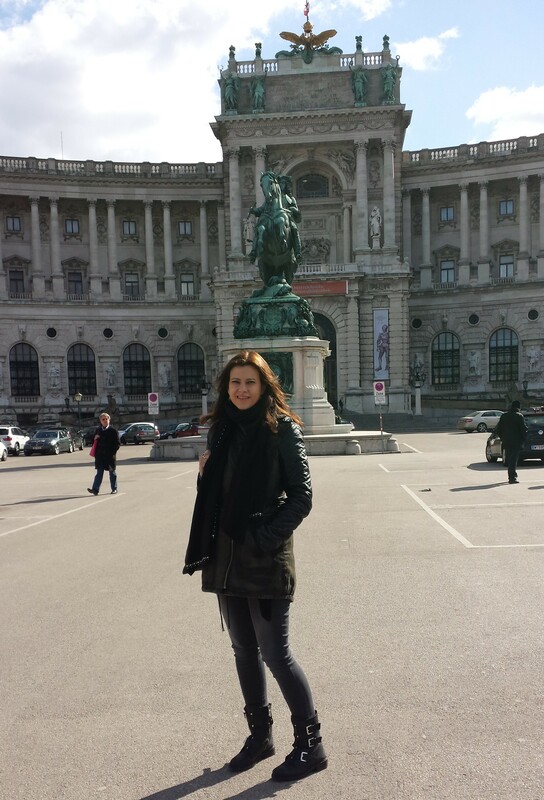 Later in the day we visited The Hofburg, which used to be the main royal residence and is situated in the centre of the city. This and the Schönbrunn were especially interesting to me because I have started reading a novel about Sisi, Empress Elisabeth of Austria (The Accidental Empress by Allison Pataki). Sisi was a complex and fascinating character who married Emperor Franz Joseph in 1853. It was great to see the famous painting of her in real life and to stand in the room where she sat for 2-3 hours a day having her ankle-length hair coiffured. 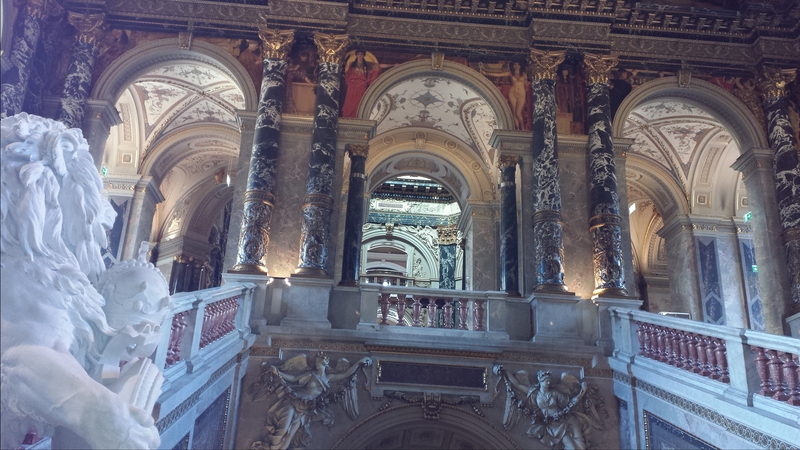 On Tuesday I got to see Birgit’s much loved, Kunsthistorisches Museum (The Vienna Art History Museum). The building itself is just as breath-taking as the vast collection of artefacts it holds, accumulated by the House of Habsburg over their reign of around 600 years. It was good to see B’s favourite pieces such as the Fury and Pieter Brueghel the Elder’s Hunters in the Snow, after reading about them here. 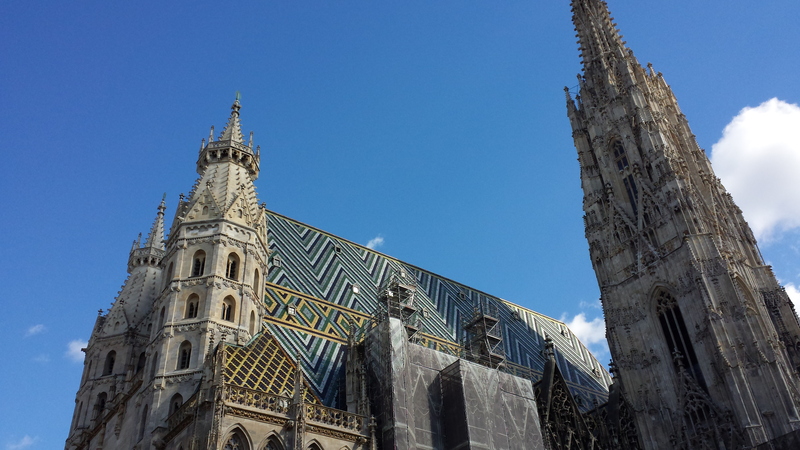 Later that day I was very pleased to finally visit St.Stephen’s Cathedral – which is the symbol of Vienna – after catching glimpses of it from afar. Churches rarely fail to inspire me and Gothic churches such as this feel particularly special. The architecture, both outside and in, is remarkable and the fact that it was bathed in a soft violet light for Lent added to its otherworldly beauty. Wednesday was perfume day! After breakfast, B left me in the capable fumie hands of Sandra and Val the Cookie Queen – who had travelled down especially from her town near Salzburg for the day. It was a real thrill to meet up in her home country for once and to have the opportunity to get to know Sandra better. We hit four niche perfumeries which were all within walking distance of one another. 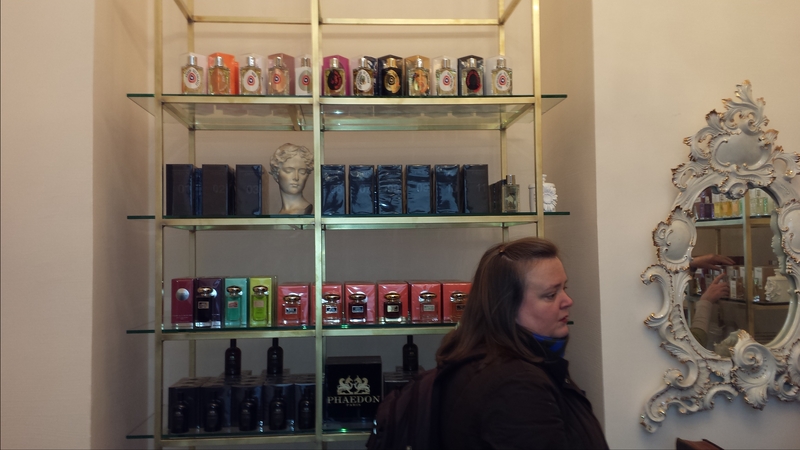 First was Le Dix Neuf which is compact in size but has a nicely displayed and curated collection of fragrances. 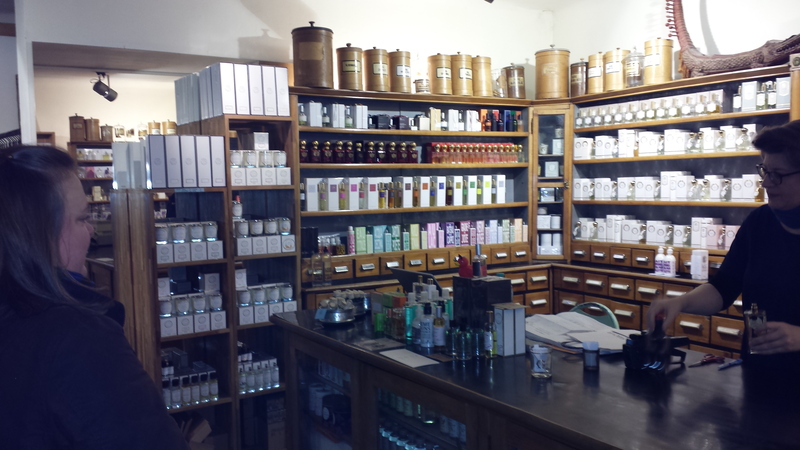 Here they stock Histories de Parfums, Parfumerie Generale, Nasomatto, Byredo, Agonist, SoOud, The Different Company, Mona di Orio, Montale and more. Next was Le Parfum which I was eager to see because B had mentioned it on the blog a number of times. It was a bright, luxe looking boutique with upscale brands such as By Kilian, Xerjoff and Tom Ford, as well as Penhaligon’s, Serge Lutens, Ramon Monegal and the exclusive Guerlains among others. 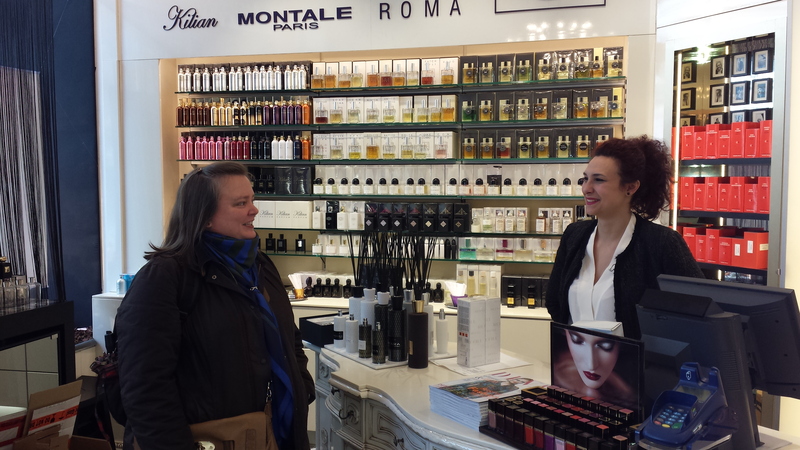 Kussmund Wien at Habsburgergasse 14 is a brand new store which stocks niche perfume lines such as Etat Libre d’Orange, Phaedon and Frapin, as well as top beauty brands like Lipstick Queen and By Terry. The staff were very helpful and I’m sure they will be a great success. Val tried Rien Intense Incense by ELd’O on skin. The dark, leathery, smoky incense made me think of India and Val liked it a lot. Finally we went to Duft und Kultur which has a quirky selection of toiletries, jewellery, clothing etc. as well as perfumes from companies including Diptyque, L’Artisan Parfumeur and Eau d’Italie. We tested Cuir Cuba Intense, the new fragrance by Parfums de Nicolai. Val pegged the powerful opening spice note as caraway seed. It was a pungent and distinctive beginning but may have smoothed out over time. At the Hermès boutique I contemplated purchasing Hermessence Cuir d’Ange but was still unable to make up my mind. No perfume purchases this trip. We met up with B again at the tram station where we said our good-byes – for now. I loved Vienna, but more than its many wonderful sights, I loved getting to spend some time living with B and her family. The Husband is just as witty and multi-talented as you would gather from reading about him here. From surgery and art, to carpentry and cookery (plus a little accessory-making on the side), he seems to be able to turn his hand to just about anything. By all rights he should have an ego the size of Austria, but instead, this Renaissance Man is incredibly down-to-earth with a ready smile and a self-deprecating sense of humour. As for the boys, I could go on all day about how amazing they are. I didn’t anticipate getting quite as attached to them as I did. Both very different in character but equally kind, bright and extremely loving. Pauli is a thoughtful, polite and quietly confident young man, while Niki is a bundle of energy, fun and pure emotion – with a big appetite! They completely stole my heart. Getting to see my great friend in her roles as a caring wife and mother also revealed other sides to her I hadn’t seen before. I’m very grateful to have been accepted so completely into their home. Living in the midst of such a warm and affectionate family was a privilege as well as a joy. 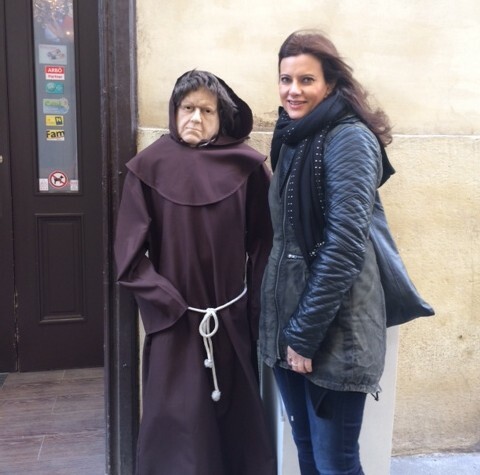 This entry was posted in By Tara, Travels, Vienna and tagged Travel, Vienna. Bookmark the permalink. It was great to read the complete illustrated account of your trip. What a lot you packed in, helped as you say by the early starts. 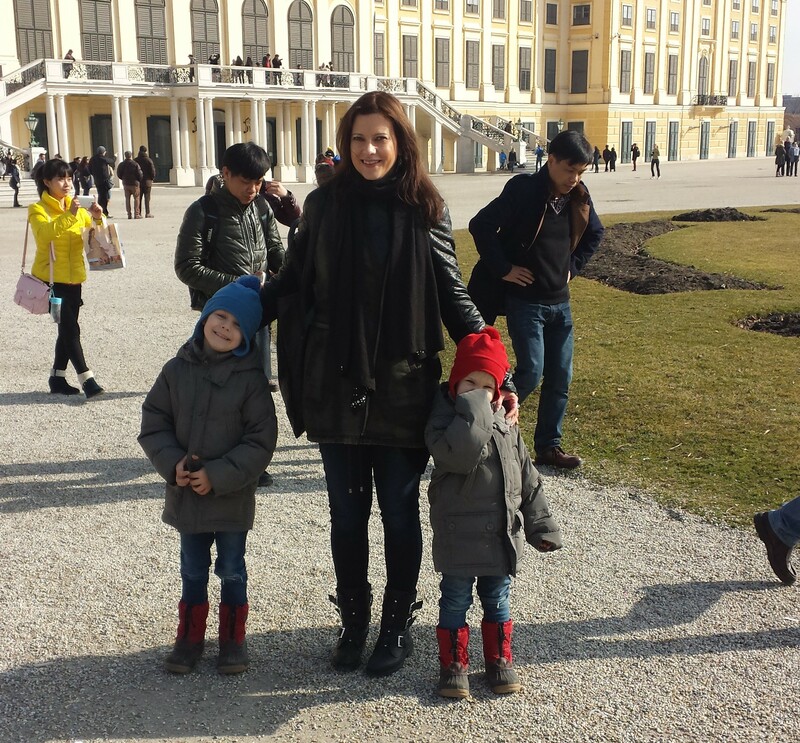 😉 Vienna is beautiful, but to explore it with the help of a native (or a whole family of natives, indeed!) is hands down the best way to do the tourist trail. That whizz through history sounds a highlight. I love ghost trains and fancy the sound of that. And how good it must have been to spend such a lot of time in Birgit’s company and also the other members of the Austrian perfume crew. I’m not at all surprised that you have left your heart in Vienna!! The Husband has many hidden talents. He had made the table we ate dinner on and painted some of the impressive art work on the walls. The scarf holder was intend a big clue! What a wonderful trip! I’m jealous that the husband cooked for you. I love reading about perfume people getting together like this. Vienna looks like a really beautiful place to see. I’m sure the pictures don’t even come close to doing it justice. No perfume purchases! That’s some impressive willpower especially with all the perfume shops you visited. I loved seeing the pics of your meet-up with B and Portia in NYC, poodle. The Husband cooked an amazing three course meal one night. Chicken soup with dumplings to start, Wiener Schnitzel wtih potato salad for main and a fab melt-in-the-middle chocolate pudding for dessert. My ideal meal basically. I rarely find stuff I think is FB worthy though I’m sure I would have bought Misia if it was out in time. Cuir d’Ange is great but it was a lot of money and one of the top notes bothered me. I have a FB of Osmanthe Yunnan but I waited a couple of years for that to come up cheap on Ebay! It was lovely meeting you Tara. I am so glad you love Vienna because I can the hope that you will be back soon. What a lovely story and good read about Vienna. So nice to read that there is a chance to meet online and get friends offline. Vanessa, there is every chance to make true friends offline if you are able to meet up. It’s been the best part of this hobby for me. I’m so happy you enjoyed it ringthing! 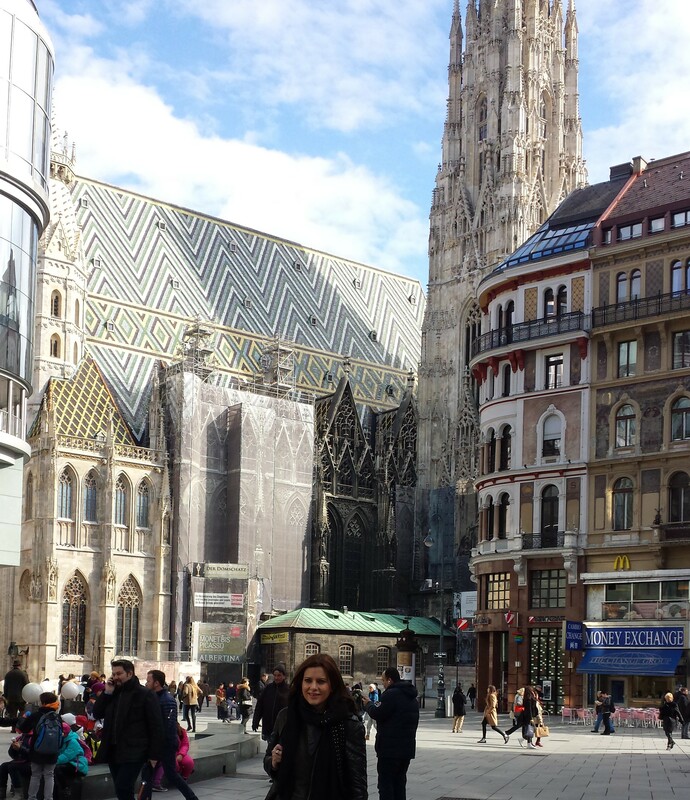 Vienna is such a stunning city. I got to do so many great things with so many great people there. It was so great having you, Tara! With you I saw Vienna through new eyes and I’m glad to live in this beautiful city. I’m so pleased it worked out so well, B! You should be extremely proud to live in your great city. Looks like the weather was on your side as well. Ines, I so loved reading about your holiday with Asali last summer. It was fab to do something similar with B. I think we were very lucky with the weather overall. Only one brolly (umbrella!) day. I’m glad it came across that way because it really was a great experience all round. I hope we can meet up in the not too distant future. Tara, I think all of us here are wishing we could be you on this fabulous vacation, meeting and staying with Birgit and her family, exploring that beautiful city and catching up with the two other lovely ‘fumies from the OT. You fit into all that beauty very well!! I really enjoyed seeing these photos of all of you, and of Vienna’s sites. I love the design of the roof on St. Stephen’s Cathedral. It lends a very cool, modern touch to a classic design of architecture. Thanks Suzanne! You’ve summed up so much about what was great about this holiday. I love the roof of St. Stephen’s too. Such a striking design. for years. He was especially ecstatic about the pastries and the coffee, as well as the architecture and the music. I imagine that he returned many times since he was in love with the place. anitathepianist, it was so good to finally meet The Husband and the boys after seeing pics and hearing about them for so long. I felt like I knew them already. Vienna is such an impressive place, I’m not the first and I won’t be the last to fall in love with it. However, I’ve just realised I never had a pastry! Penelope, I really hope you get to Vienna at some point. I can’t recommend it highly enough. It was so good of B and her family to open up their home to me. It made all the difference. What an ardent declaration of love to a beautiful city (and family), I very much enjoyed reading all about your trip, Tara! Haha, and your last sentence reminds me of the book I am reading at the moment, it’s an interesting study on the Austrian-American Arnold Schwarzenegger. It must sound rather over-the-top but it’s honestly how I felt/do feel about the city and B’s family. Both well and truly got under my skin. We really did happyface313! I feel very lucky. Glad you enjoyed reading about it. Hi Tara! Thanks so much for sharing your travel stories in so much fabulous detail! I almost felt like I was with you step by step around the city. Sounds like you had a wonderful time, and the photos are excellent, nice to ‘see’ you all! To some extent this trip was an experiment which involved a leap of faith on behalf of both B and myself, so it’s wonderful that it paid off so well. Having a house guest for the first time is a nerve-wracking experience so I’m grateful B took a chance on me and I had the guts to go for it. Hope you have as much fun on your trip to Europe this summer/winter! Ah… My travel plans keep morphing, it’s now looking like I can’t do everything I want to this year and may split the trip in two – US & Canada this year, and Europe next. Which is good, I need a bit more time to plan Europe I think… So much to do! And blessed that my life gives me such choices. Tina, it is really great that you are able to make these big trips. Too bad you won’t make it to Europe this year but it’s something to look forward to in 2016. Have a fab time in Canada and the US. This post had everything – perfume, lovely people, beautiful sights, and most importantly, bacon. I’m so glad that you had a lovely time, and even more glad that you shared it with us. Thanks very much Thomas! It doesn’t get much better really. What a wonderful holiday and I’m so glad you did it. Ahhhh Vienna. Where is your next big trip? Sydney? I saw the hotel you stay at in Vienna, Portia and it’s a perfect location. I can certainly see why you love the city so much. What a bonus to have great friends there now too. Travelling abroad alone was a big step for me. I would dearly love to visit Sydney one day. Yes, next time we are in Vienna you must come back and hang there too. It’s a Top 5 city for me, always fun and interesting and I’ve not done the theatre show yet. Traveling alone is the BEST way to do it, I’m glad you’ve found out how spectacularly fun it is. We would be thrilled to have you come stay in Sydney too Tara. It’s another barrier broken down for me Portia, which is great. I’d love to hang out with you in Vienna! Fingers crossed I will make it to Sydney with Val one day. Tara, even though I’ve previously seen most of the pictures on FB, with the story they looked even better! 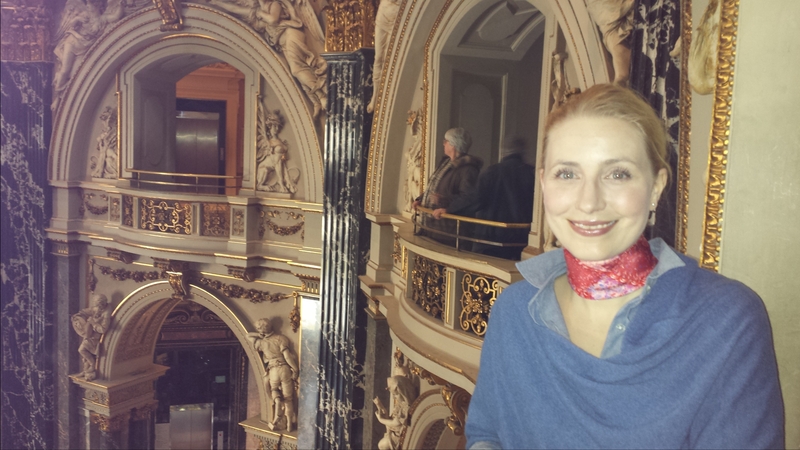 I love Vienna and I’m glad you had wonderful time there! Now, when you feel brave, it’s time to think of other travels 😉 You, Birgit, Vanessa and Val should come to SF! I loved seeing the text with the pics too, Undina. Isn’t B ridiculously photogenic? What a lovely post, Tara with amazing photos! You are indeed lucky to stay with lovely people and see a beautiful city with them. A trip to be treasured forever! Thanks Annette. It was a very special trip. I was more than a little emotional by the end of it.